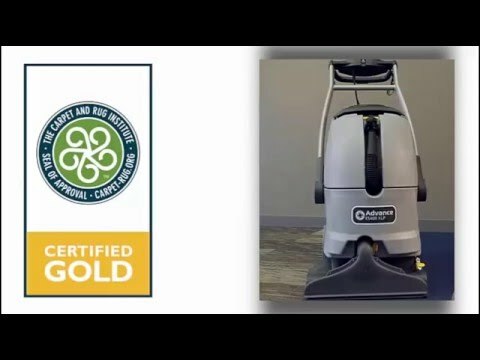 Advance ES300™ ST Self Contained Carpet Extractor - 16"
Built on the industry leading AquaClean[R] platform, this multi-purpose machine is ideal for cleaning your high-traffic carpeted areas. Solution tank: 9 Gal. ; Recovery tank: 7 Gal. Front mounted nozzle makes dumping much faster and easier for the operator. Simply flip a switch to easily shift from spotting to extraction mode. The removable, increased capacity tank along with the stowable handle make refilling much simpler. The front-mounted drain hose allows for faster and easier dumping for the operator. A floating brush head needs no adjusting, creating better carpet contact and improved water recovery. The removable tank with stowable handle makes the re-filling process far less cumbersome. All cleaning modes are mounted on the panel for quick engagement and easy operation. A larger tank with increased water capacity provides extended cleaning time and fewer refills. Handle design means improved maneuverability in tight spaces.